Here for radio hobbyists are eleven handy-dandy 'kinks,' otherwise known as tricks, shortcuts, or clever ideas, that could prove useful while working in the lab at work or in your shop at home. Admittedly, most of these ideas would not have much application with today's ready-made radios, antennas, power supplies, etc., but there are still people who build custom equipment and/or repair circuits. The most useful kink offered here that could come in handy for anybody is to clip off part of a closed ring terminal lug to allow it to be installed and uninstalled without needing to remove the cinching nut and possibly other lugs also on the same binding post. 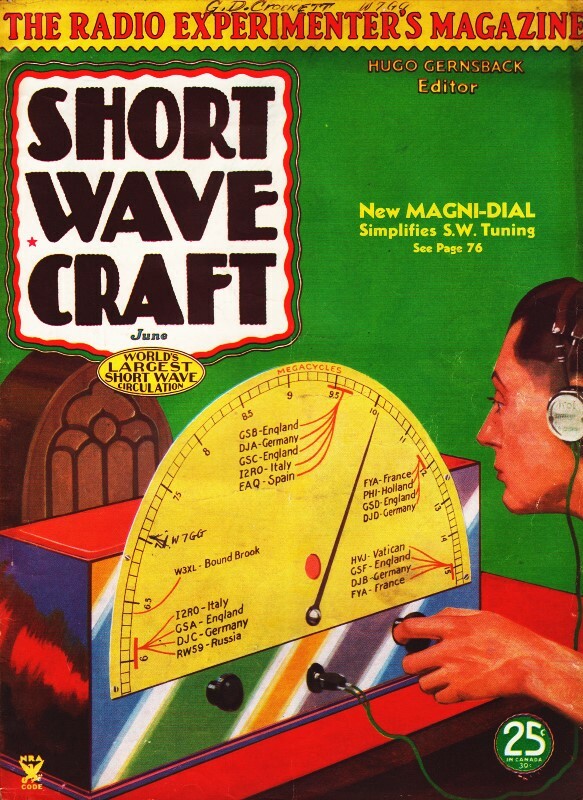 "Kink" Editor, Short Wave Craft. This is what I use for transposition blocks. They are rings cut from any kind of insulating material that will stand the weather. A whole set can be made in a short time with a handsaw and miter box. Just saw them off a tube, then cut them square across on each side. If preferable, you can bore a hole in the bottom of the cut to be sure the wire won't slip out. 1. The very minimum of material so they should be low loss. 2. All sides push to the center when there is a strain on them so they won't buckle. 4. The wire doesn't have to be threaded through holes - can be put on anywhere. Here is a fly-cutter constructed from easily obtained parts. It consists of a piece of 1/2'' stock 1 1/2" long and drilled as shown in diagram. One 1/4" machine lathe tool, two 1/4" set screws and a 1/4" drill make up the rest of the parts necessary. The drill is ground flat on one side to receive the set screw to prevent slipping. As you see it has no adjustment and is used to cut 1 1/4" holes for tube sockets. It is very efficient and rids us of the annoying slippage of adjustment in factory-made cutters. Here is how to save money in building a monitor or other short-wave apparatus requiring a shield post. An old varnish can is just the thing for the job, being of the right size and shape. One may encounter difficulties in cleaning it; however, this can be done with turpentine or other paint-removers solutions. The first step is to cut off the handle and the spout; then proceed to cut a hole in the narrow side large enough to admit the batteries. Be sure to provide for a smooth edge around this hole so that you will not cut yourself on the rough or sharp edges. The opening should be fitted with a lead as shown in the drawing. After the can has been made over as desired, it can be given a coat of black enamel, or some other artistic decoration can be applied. - S. R. Radom, Opr. Many of the readers of Short Wave Craft who desire to practice code without the cost of building an entirely separate audio oscillator can accomplish this very easily by building the unit described in the drawings. It consists of an audio transformer on which has been mounted a tube base. The number of prongs conforms with the number of prongs on your plug-in coils, and the entire instrument plugs into the coil socket, the same as your short-wave coils. A diagram is also shown and indicates where the key may be inserted. In making coil forms by cementing tube base together, I could not find a suitable cement and the coil forms soon fell apart. After much experiment I found a mixture which answered the purpose very well. It is made by mixing together two parts of ether and one part of alcohol, both of which can be obtained at any near-by drug store. To the mixture of alcohol and ether, celluloid chips are added and allowed to stand in a corked bottle overnight. In the morning if the solution is still watery, add more chips and let stand again. When a thick liquid is formed it will be ready for us. Making coil forms is not its only use for it can be used for holding the wire in place on spaced coils, fastening tubes that have become loosened from their bases and thousands of other uses. Many fans would like to use an antenna coupling coil instead of the usual capacitive coupling used in most receivers. The diagram clearly shows how a mounting bracket can be constructed which will allow varying the coupling for different short-wave bands. It is also advisable to use the condenser in series with the coil and the antenna in order to make use of what tuning may be possible. The contacts for keys or relays can be replaced when worn by substituting the used contacts from almost any type of automobile distributor. The discarded points can usually be obtained from your local garage. After cleaning and a little filing, when soldered to the key or relay, they become a serviceable contact about 3/16 inch in diameter. The contact No. 1 is found only on Ford Model A and AA and serves well as the adjustable contact for a telegraph relay. Many of the readers of Short Wave Craft who hare burned off the contacts of their keys or relays will find this kink very useful and the new contacts will stand up for a very long time, because of the hardness of them and if sufficient filter is used to suppress the spark. Here is my radio kink. It is a simple relay that can be made in about one hour. Most of the parts can be found in your junk box. It can be used for many things; it will make a motor go by means or a beam of light. or course, you hare to have other parts, amplifier, etc. It will do what any other sensitive relay can do. Many experimenters have difficulty in obtaining sufficient light for their workbench without using a very powerful bulb. This can be overcome by stretching a piece of No. 14 wire across the length of the workbench and attaching an old fixture ring as shown in the drawing; the entire lamp can then be slid from one end of the bench to the other and will enable you to have a light where you want it. The drawing clearly shows how a separate clamp can be made if one desires to go to the extra trouble. Another useful kink that I have used quite often is also shown among the drawings. when you have a closed connecting lug and you wish to overcome the necessity of removing the binding post nut each time, it is only necessary to cut out a section of the lug with a pair of diagonal pliers or tin snips.